East Kelowna’s SpearHead Winery is now firmly committed to Pinot Noir with its announcement that Grant Stanley has been named its general manager and winemaker. Grant’s dedication to Pinot Noir is legendary. He once told me that he spends 80% of his time thinking about Pinot Noir. Grant was born in Vancouver in 1967 to parents who had emigrated from New Zealand. He developed his passion for wine while working in the restaurant trade in London and in Whistler. Excited by the wines of New Zealand, he and his wife, Annabelle, moved to New Zealand in 1991. A horticulturalist, she began propagating vines at the storied Cloudy Bay winery while Grant went to work at Montana Wines, one of New Zealand’s largest producers. Montana made it possible for him to take a two-year diploma course in winemaking. From there, Stanley sought out smaller wineries, eventually spending six vintages at Ata Rangi, one of New Zealand’s best producers of Pinot Noir. In the fall of 2001, he was sent to Oregon to make Pinot Noir with two wineries there. Before returning to New Zealand, Grant did a quick tour of the Okanagan. He was astounded at how much Okanagan wines had improved in the years that he had been in New Zealand. He did not hesitate to return to Canada when Quails’ Gate Estate Winery offered him the winemaking job just before the 2003 vintage. He moved to 50th Estate Parallel Winery in Lake Country in 2013. He made four vintages there and consulted with his successor, Matt Fortuna, in the 2017 vintage. He also made the 2017 vintage at SpearHead, the smallest of the Okanagan wineries Grant has been associated with. SpearHead produces about 4,500 cases. Production this year moves to a new building with a capacity that would allow it to double in size, depending on the supply of grapes and on the market for its wines. At this time, 8,000 or so cases would be SpearHead’s maximum. The winery, which opened with the 2010 vintage, originally was called SpierHead, a name inspired by its location on Spiers Road in East Kelowna. The name has just been modified to SpearHead to avoid a trademark dispute with Spier Wine Farm, a South African winery founded in 1692. It has several listings in British Columbia. SpearHead had three founders. The instigator was Kelowna photographer Brian Sprout (who subsequently left the partnership). He enlisted a high school classmate, lawyer Bill Knutson, and a semi-retired investment dealer, Bruce Hirtle. Knutson, who still has a busy Vancouver law practice, and his wife, Marina, (right) now are majority owners. The partners bought the Spiers Road property, a former apple orchard, in 2007 and began planting it in 2008. There are now 12 acres in production, with three more planted. The vines are predominantly Pinot Noir, with smaller blocks of Riesling and Chardonnay. SpearHead’s early vintages included two well-received Bordeaux reds made with grapes from a vineyard on Black Sage Road. This was a measure to get the brand into the market but not a long-term strategy. Serious hail damage in 2013 led the winery to find additional sources of fruit, notably the Golden Retreat Vineyard in Summerland where, David Kozuki, a meticulous grower, has Pinot Noir and Pinot Gris. SpearHead’s estate vineyard grows multiple clones of Pinot Noir. “One of the things I hope we can develop a niche with is a significant variety of Pinot Noir clones, in the hopes that will allow for different bottlings,” Bill told me last year. Grant, who brings his 2 ½- acre Pinot Noir vineyard in West Kelowna to SpearHead, is clearly on the same page as Bill and Marina. He intends to produce several single vineyard Pinot Noirs and a few blended Pinots, including a wine called Consensus. This Pinot Noir was begun several years ago when members of SpearHead’s wine club were invited to create their own blend. Several vintages of Consensus have won gold medals at competition. Grant would like to increase production slightly and offer some to the public. Here are notes on Grant’s first releases from SpearHead. Prices do not include tax. SpearHead White Pinot Noir 2017 ($24 for 500 cases). White Pinot Noir is rarely made but when you taste this crisp and aromatic white, you will wonder why more is not made. It is made from essentially free run juice after gently pressing whole bunches. It begins with aromas of apples and white peaches, which are echoed on the palate. The lively acidity, balanced with a touch of residual sugar, gives lift to the savoury flavours. 91. SpearHead Riesling 2017 ($20 for 500 cases). The Germans would call this a racy wine and would cellar it five to 10 years. The 7.8 grams of acid are balanced with eight grams of residual sugar, just enough to give the wine the palate tension one looks for in a good Riesling. It has aromas and flavours of lime, along with a steely spine of minerals. 91. SpearHead Pinot Gris 2017 ($19 for 1,000 cases). Ten percent of the juice was fermented in two-year-old French oak barrels while the rest was cold fermented in stainless steel. It has aromas and flavours of peaches and pears with a crisp and dry finish. The winery says drink this “now or cellar for 3 to 5 years.” I would rest it for two or three months for optimal development of aromas and flavour. 90. SpearHead Pinot Noir Rosé 2017 ($21 for 500 cases). This wine was made with subsequent pressings of the grapes used for the White Pinot Noir. The wine’s delicate rose petal hue is the result 48 hours of skin contact. It begins with aromas of raspberries and has flavours of raspberry and strawberry. It is balanced to finish dry. 90. Wines from the 2017 vintage are beginning to be released by Okanagan wineries and the news is good: another excellent vintage. Lang Vineyards, one of the original wineries to open on the Naramata Bench, brought its new releases to a recent tasting in Vancouver. That provided an early taste of the vintage from one of the most popular wine regions in B.C. There will be another chance to taste the new Naramata Bench wines when the Naramata Bench Wineries Association hosts its annual spring tasting in Vancouver on April 13. There is a trade tasting at the Four Seasons Hotel in the afternoon. It is followed by Wine for Waves, a public fundraiser in the evening for the Vancouver Aquarium. Lang is a member of the association. Lang Vineyards was opened in 1990 by Günter Lang, a one-time Mercedes Benz manager who had emigrated to Canada in 1979 and was charmed with the Naramata Bench. He sold the winery in 2005 to the Holman Lang Group, stayed on for a while to help run it until disillusioned by Keith Holman’s shambolic management. The Holman Lang group was in bankruptcy by 2009. The following year, Lang Vineyards was acquired in a court-ordered sale by Yong Wang, a businessman who divides his time between Vancouver and China. The new owner soon restored the link to the winery’s founder by hiring Günter’s nephew, Mike Lang, as general manager. Initially, the winery struggled with a turnover of winemakers. Production stabilized in recent years when Robert Thielicke, formerly a winemaker at JoieFarm Winery, took charge of winemaking at Lang Vineyards. The 2017 vintage was the fifth vintage in a row that produced good to great grapes. The 2017 whites share the qualities of the previous year: bright acidity, intense and refreshing flavours. Here are notes on the wines. Prices do not include taxes. Lang Sparkling Pinot Noir/Pinot Meunier 2017 ($18.99). With a lovely pink hue and a rush of bubbles, the wine offers a great show in the glass. It has aromas and flavours of strawberry and cherry. The finish is crisp. This is the third sparkling wine from Lang since 2015. 88. Lang Bravo White 2017 ($16.49). This is a blend of Riesling, Gewürztraminer, Pinot Blanc, Schönburger and Muscat. It begins with floral and fruity aromas and delivers a mouthful of tropical flavours – lime, lychee, peach – with a hint of spice on the finish. 91. Lang Gewürztraminer 2017 ($17.49). Rich on the palate, this wine begins with aromas of rose petals and spice and delivers flavours of lychee and orange zest. It is nicely balanced to finish drier than it really is. 91. Lang Farm Reserve Riesling 2017 ($17.49). This arguably the flagship white wine at Lang. It is brimming with primary fruit aromas and flavours – lemon and lime with tangy acidity. The likely evolution of this wine was shown by tasting the 2016 Farm Reserve Riesling along side this wine. The extra year has given the 2016 wine more flesh and notes of petrol. Both have a long, lingering finish. 91. Lang Viognier 2016 ($18.49). The wine is made with grapes from the Naramata Bench. It begins with tropical fruit aromas (pineapple, apricot), leading to a rich texture and flavours of apple, peach and pineapple. 91. Lang Cabernet Franc 2016 ($21.69). The previous vintage showed dramatic brambly aromas and flavours. This was a tank sample that promises a lot of flavour and aroma development when it has time in bottle. The wine, now full of brooding cherry flavours, is made with grapes from Oliver. 90. Lang Syrah 2016 ($22.49). This is a tank sample. The black cherry and fig aromas and flavours show good potential when the wine has had time to develop in bottle. 90 - ? Lang Maréchal Foch 2016 ($18.29). This is the signature red at Lang Vineyards. It is a juicy red with soft tannins and with aromas and flavours of cherry, plum and chocolate. 90. The excellent notes that CedarCreek prepares on its wine indicate that nearly all of these six wines were released last year. However, the covering letter with the samples is dated early February, 2018. That suggests the wines might still be available in the wine shop, through the web site or in some restaurants. The wine shop sales last year likely were a bit slow because of the disruption caused by construction. In fact, access to the shop was not as difficult as it looked from the road. It is worth noting that three of reds are from the 2014 vintage, so far still the best Okanagan vintage ever. The other vintages shown by these wines are none too shabby either. Most of the fruit, if not all, for the reds comes from CedarCreek’s two Osoyoos vineyards – Desert Ridge, not far north of town, and Haynes Creek, just southeast of the town with a slope to Osoyoos Lake. Planted in the early 2000s, the vines are now mature and are producing top quality fruit. The winery’s notes reveal that the winemaking is painstaking in its detail. For example, 10% of the Riesling was fermented with wild yeast in French oak, providing a portion of the blend that adds texture and mouth feel to the wine. The centerpiece of this release would be the 2014 The Last Word. “Only a few times a decade, when nature conspires, does the opportunity for as truly remarkable wine reveal itself,” the winery’s notes say. The four varietals in the blend were co-fermented on the skins for 29 days in concrete and then aged 20 months in French oak. The winery says the wine has “excellent tannin structure. Spicy dark fruit will evolve and intensify with age. Should peak 2024 to 2029.” The price – this is one of the most expensive wines yet from CedarCreek – tells you how much the winery esteems this wine. CedarCreek Platinum Block 3 Riesling 2016 ($23.99 for 341 cases). The wine is exquisitely balanced: racy acidity of 10.1 grams is offset with 14.8 grams of residual sugar. There is just 10.5% alcohol. Those numbers, however, tell us that this wine can be enjoyed now but will age through its 10th birthday. At this stage in its development, there is just a hint of petrol mingled with the citrus aromas and intense lemon and lime flavours. The bright acidity gives the wine a refreshing, tangy finish. 92. CedarCreek The Senator Red 2015 ($17.49 for 2,335 cases). This is a blend of 40% Cabernet Franc, 24% Cabernet Sauvignon, 22% Syrah, 14% Merlot. The wine was aged 16 months in French oak. It begins with aromas of blackberry and cherry, leading to flavours of prune, figs, dark chocolate and coffee. The texture is firm. 89. CedarCreek Estate Syrah 2015 ($24.49 for 603 cases). This wine, which is sold only at the winery and to the wine club, is made with grapes from the winery’s Haynes Creek Vineyard in Osoyoos. It begins with aromas of plum and fig along with a meaty note reminiscent of rare steak. That is echoed on the earthy palate, along with a note of black pepper. 90. CedarCreek Platinum Desert Ridge Merlot 2014 ($49.99 for 1,102 cases). The winery’s Desert Ridge Vineyard north of Osoyoos includes 11 acres of Merlot and – to quote the winery “within them four distinct levels of refinement in the fruit.” The best fruit is hand-selected for this ultra-premium wine. It begins with lovely aromas of cassis, black cherry and vanilla (reflecting 20 months oak aging). The wine opens with flavours of cherry, black currant and blueberry. The long, ripe tannins give the wine a silken polish to the c0ncentrated texture. 92. CedarCreek The Last Word 2014 ($85 for 390 cases). The blend is 34% Merlot, 31% Cabernet Franc, 26% Cabernet Sauvignon and 9% Malbec. The grapes were co-fermented in concrete and the wine was aged 20 months in French oak. It is a dark and concentrated wine with layers of fruit. It begins with aromas of blueberry, cherry and vanilla. On the palate, the wine is rich and deep, with layer after layer of dark red fruit revealing itself. The wine was double decanted to unlock the flavours. A better idea would be the lay the wine away at least for 10 years. 94. Liquidity Wines, a wine producer at Okanagan Falls, has come up with a clever vehicle for marketing its emerging range of reserve wine: a taste-before-you-buy club. Liquidity now has two wine clubs, both featuring free shipping. The existing club has no annual fee and offers members selections from estate wines in the portfolio. While there likely will be some overlap in club offering, members of the new Equity Tasting Club – membership is limited to about 100 – will pay $75 a year. They will commit to buying 18 bottles a year, six of which will be Reserve Tier wines. Twice a year, before they buy, they will receive a sample box of upcoming unreleased vintages. 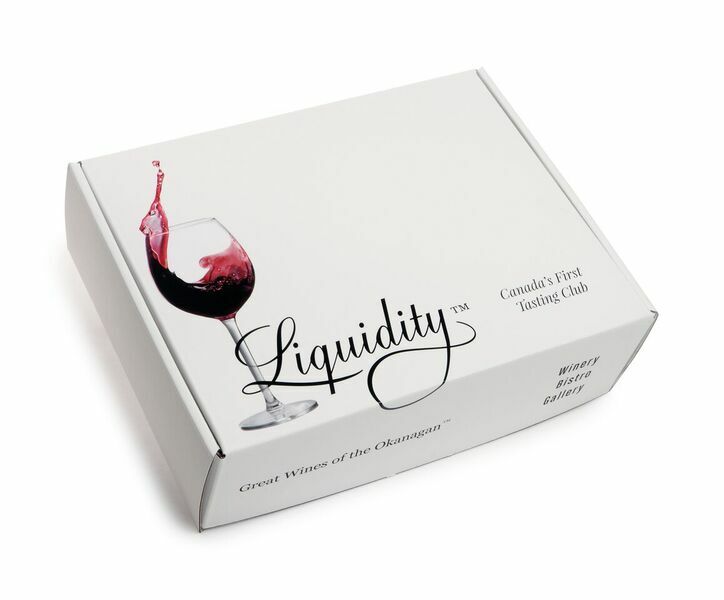 Each box has three 200 ml samples of premium wines available for ordering. The wines will arrive with the winemaker’s notes. There also are other benefits offered to Equity Club members, including access to library wine releases. My initial reaction was why do I need to taste Alison’s wines before I commit to buying them. She has quickly established a formidable track record for producing very solid wines at Liquidity. The winery now makes around 7,500 cases a year and is particularly notable for its Pinot Noir and its Chardonnay. But I take Alison’s point that it is reasonable for buyers of expensive wines to have the opportunity to taste before committing the big bucks. The sample box sent to media reviewers included three unreleased wines; one was a 2016 Chardonnay Reserve and one was a 2016 Estate Chardonnay. Both are fine wines but the Reserve is a significant step up in complexity. Reserve wines should be stand-out wines. There are a handful of producers that use the reserve designation so loosely that it really means nothing. Surely, $20 wines, however well made, are unlikely to achieve reserve quality levels. Liquidity’s estate wines already are excellent but the Reserve wines show an extra degree of care, both in the vineyard and in the winemaking. Among other wines, Alison has laid down both a traditional method sparkling wine and a premium Merlot as part of the winery’s premium program. The sparkling wine cuvée, only 125 cases, will not be released until 2020, after it has had three years aging on the lees. It sounds like it would a good idea to join the Equity Tasting Club, f0r advance notice of the exciting wines in Liquidity’s pipeline. Here are notes on the trio in the initial Equity Tasting Club sampler. The next taster box will have samples of Viognier 2017, Rose 2017 and 2016 Equity Pinot Noir. Liquidity Reserve Chardonnay 2016 ($N/A). This is a rich and powerful wine, with a creamy texture. The buttery, marmalade flavours are enhanced with a touch of vanilla from very well-handled oak. 92. My last visit to taste in the Okanagan was during a surprisingly cold and snowy week early in November. However, I managed to keep my rental car on the road and I got to all my appointments on time. In fact, the tastings were often quite leisurely because the usual wine tourists had the good sense to stay off the roads. My final appointment was with Stefan Arnason, the winemaker at Poplar Grove Winery in Penticton. He had spent the better part of that week judging wine in California. His return flight through Vancouver had been delayed by the weather. Fortunately for me, Natasha Ponich, his assistant, took me through an excellent tasting of Poplar Grove’s premium wines. Some of those are just being released or will be released later this year. The current release package from the winery’s marketing staff includes just three wines, among them the first 2017 Pinot Gris I have seen. The superb 2016 Pinot Gris I tasted with Natasha is sold out. In due course, her love of the rural lifestyle brought her to the Okanagan Valley. She got a job with Earlco Holdings Ltd., a major vineyard management company based on the Naramata Bench. She spent five years there and also completed to the winemaking program at Okanagan College. When Natasha moved back to Vancouver Island (for personal reasons), she was hired by Bill Montgomery, who had opened 40 Knots Vineyard & Winery at Comox in 2011. 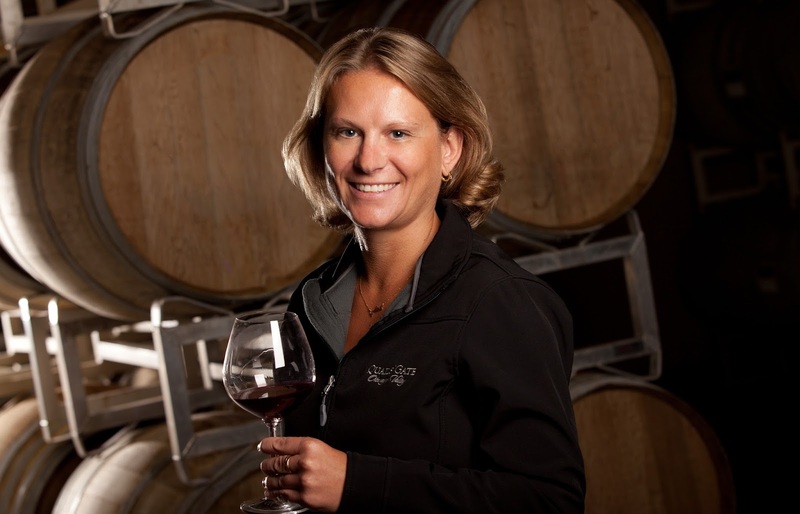 About the time he sold the winery in 2014, Natasha returned to the Okanagan, eventually landing the enviable assistant winemaker post at the prestigious Poplar Grove winery. Poplar Grove was established about 1995 by Ian and Gitta Sutherland. The wines, especially the reds, developed an early cult following. It is no longer a boutique winery but it has, if anything, a stronger following. In 2008, Tony Holler, a Naramata Bench neighbour of Ian, acquired control of Poplar Grove and transformed its status. The son of Austrian immigrants, Tony, born in 1951, grew up on a Summerland orchard, went to medical school and succeeded in the pharmaceutical industry. He has applied his focussed entrepreneurship to the wine business. He already was buying Poplar Grove wines and believed in the Okanagan’s potential to produce wines ranking with the best in the world. “I wasn’t that interested in having a tiny boutique winery,” Tony said. So he invested in vineyards to become nearly self sufficient in grapes, and in a well equipped modern winery. The answer is in the impressive portfolio made by the winemaking team. Poplar Grove is now a Holler family project, with one of the owner’s sons now living in the valley and growing grapes. Here are my notes. The wines will make you a believer, too. Poplar Grove Pinot Gris 2017 ($17.30). Natasha says she is “super excited” about the white wines from the 2017 vintage, something I am hearing from others in the industry. The fruity aromas of this wine – banana, citrus, pear and apple – brought a spontaneous “wow” from a fellow taster. The wine delivers flavours of citrus, pears and apples with a touch of spice on the crisp and refreshing finish. As delicious as the wine is now, there is even more upside if you give it another few months of bottle age. 91. Poplar Grove Viognier 2016 Haynes Vineyard ($21.65). The wine begins with aromas of stone fruit and it delivers flavours of apricots, peaches and apples. The finish is crisp and racy. 91. Poplar Grove Chardonnay 2016 ($19.04). This wine delivers intense fruity aromas and flavours – peaches, citrus, cloves. The acidity is fresh and bright (the wine was not permitted to go through malolactic fermentation). Only 18% of the wine spent any time in oak. The result is a refreshing wine with great appeal. 91. Poplar Grove Reserve Chardonnay 2015 ($26 for 168 cases). This is almost a polar opposite in style. Totally fermented in oak, it is a rich, buttery wine with a medley of marmalade flavours. On the finish, there are notes of vanilla and spice. 92. Poplar Grove Syrah 2014 ($30.35). There is three percent Viognier in this wine. It begins with aromas of blueberries, licorice and fig. The palate displays a broad array of red fruits, including fig, plum, and black cherry. There is a hint of pepper on the finish. Big ripe tannins give the wine a plushness on the finish. 91. Poplar Grove Benchmark 2014 ($N/A). This is a blend of Merlot, Malbec and Cabernet Franc. The red berry aromas jump from the glass. On the palate, there are flavours of black currant, mulberry, black cherry, with a lingering spice on the finish. This is a magnificent blend; just put it down for 10 years and let it reward your patience. 92. Poplar Grove Merlot 2015 ($26). Look for this wine to be released in the fall. It is a bold, generous wine with dark, brooding flavours of black currant, dark chocolate, and blueberries. The concentrated texture signals that the wine needs to be cellared. 91. Poplar Grove Cabernet Franc 2015 Classic ($N/A). Another fall release; the grapes are from Osoyoos vineyards. The wine shows the bold character of the hot 2015 vintage. “The tannins help hold the alcohol,” Natasha says. “All of our 2015s had big alcohols.” The wine begins with perfumed aromas of blackberry, also with a delicate touch of smoke. On the palate the are flavours of brambleberries and cherries, with long ripe tannins and a finish that does not want to quit. 93. Poplar Grove Cabernet Franc Munson Mountain 2015 ($35). This is a wine to be offered first to the Poplar Grove wine club. The grapes are from the vineyard directly below the winery on Munson Mountain. The wine is earthy as well as brambly with flavours of black cherry, blackberry and spicy blueberry. 92. Poplar Grove The Legacy 2014 ($50). This is the winery’s flagship red. It is a blend of 44% Cabernet Franc, 24% Cabernet Sauvignon, 24% Merlot and 4% each of Malbec and Petit Verdot. The wine aged 21 months in oak. The wine has not yet been released but collectors need to get on the list; this superb wine is from one of the Okanagan’s best vintages and will age well. Already, it appeals with aromas off cassis and black cherry. On the palate, there is rich, dark fruit mingling sweetly with chocolate and spice. 94. I did not think that was enough detail for a wine that celebrates a significant moment in the history of BC wine. In fact, I have been around long enough to remember some of that history. Knowing it should add to your appreciation of the wine. 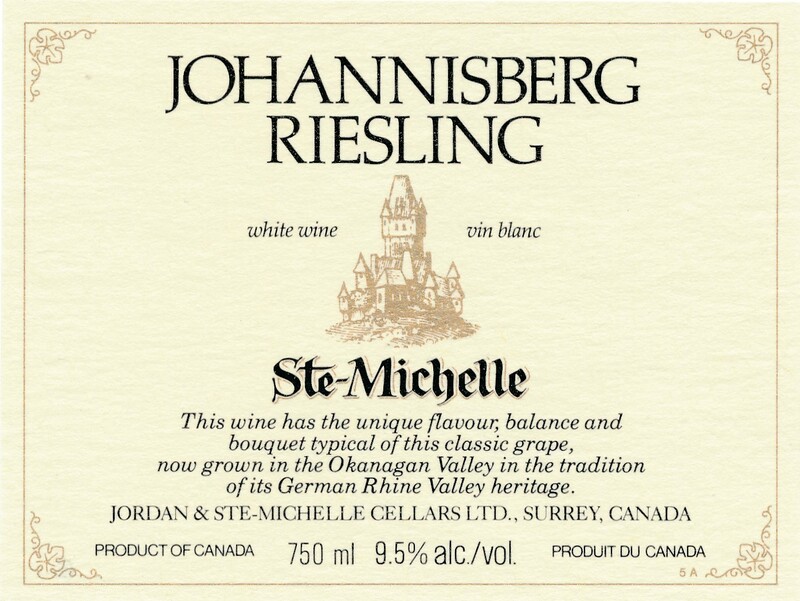 Jordan & Ste-Michelle Cellars (the correct spelling) disappeared from the BC scene after it was absorbed in the late 1980s by T. G Bright & Co. Before that, there was a long and colourful history. The roots go back to 1923 and a loganberry winery near Victoria which became known as Grower’s Wines. For many years, the controlling shareholder was Herbert Anscomb, who also became BC’s finance minister. The conflict of interest did not bother him. He actually used his power to stop Brights from building a bottling plant in BC in 1940. His greatest political rival was W.A.C Bennett, who stepped down as president of Calona Wines after he was elected to the legislature. Anscomb died in 1973 and Growers was purchased by Jordans, an Ontario winery that had begun to operate nationally. The ownership story at Jordans is complex, but the important detail is that controlling interest was acquired by Rothmans, the big cigarette producer. Rothmans gave its executives and winemakers (who were all well-trained Germans) the tools to get serious about winemaking in Canada. They built a large grape nursery in Ontario. In BC they began planting clone 21B Riesling in 1978. “I think we brought in 22,000 plants that year,” says Frank Whitehead, one of the viticulturists for Jordan & Ste-Michelle. “All planted on the long weekend in May.” And all were planted in East Kelowna, where some survive to make spectacular Old Vines Riesling at Tantalus, Sperling Vineyards and St. Hubertus. Clone 21B, sometimes called the Weis clone, was developed in the Mosel in the late 1940s by Hermann Weis. When the variety’s superior winemaking quality were realized, he began to market it outside Germany, including in Ontario and then in the Okanagan. “Jordan & Ste-Michelle financed growers in BC over three years and placed a price guarantee on the crop for the new plantings in the first few years of production,” Whitehead recalls. Quails’ Gate enters the story because Richard Stewart, whose family now operate this winery, bought vineyard land on the slopes of Mt. Boucherie in the early 1960s. The current vineyard map shows two small blocks of Maréchal Foch, totalling about two acres, which were planted in 1965. There is also a two-acre block of Chasselas, a Swiss white variety, planted in 1975. “The Stewart Vineyard was one of the main suppliers to Jordan & Ste-Michelle,” Whitehead recalls. 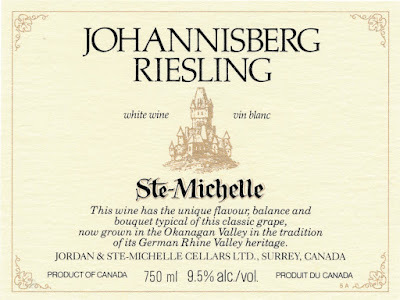 It is probable that the big winery encouraged Richard Stewart to plant Riesling as well, since Jordan & Ste-Michelle enjoyed an instant critical success with its 1981 Riesling and other vinifera table wines. At the time Jordan & Ste-Michelle had emerged as a quality wine producer. The winery had moved in 1977 from its decrepit and inefficient building on Quadra St. in Victoria to a new $6 million winery in Cloverdale. It was a beautiful facility with landscaped gardens and views of Mt. Baker. Unfortunately, the winery was dismantled in 1990 after Brights took over and moved production to its plain Jane facility north of Oliver. But Jordan had had a good run. An undated press release, probably 1982, said the winery had just introduced “its 1981 line of seven premium varietal wines.” The winery singled out Auxerrois, Maréchal Foch and Johannisberg Riesling. “These varietal wines represent the company’s continued commitment to sourcing the majority of its premium products from British Columbia vineyards,” the release says. Richard Stewart planted two blocks of Riesling. The 1981 block, likely 21B, was replaced in 2008 with 2.3 acres of Chardonnay. But the 1982 block, five acres of clone 21B grapes remains in production. The 2017 B.M.V Collector Series Riesling, the wine just being released, is a blend of this Riesling and of clone 49. Quails’ Gate planted about six acres of this in its Martyna Vineyard in East Kelowna (not far from Tantalus). Riesling lovers will be cheered by the increasing focus that Quails’ Gate winemaker Nikki Callaway (right) has been giving to the variety. While Pinot Noir remains the flagship at Quails’ Gate, the rest of the portfolio is every bit as well made. Quails’ Gate B.M.V Riesling 2017 ($29.99 for 550 cases). This wine, which was fermented with wild yeast and aged about two months in neutral barrels, has numbers that look like a fine German Riesling: 15.4 grams of residual sugar are balanced by a bracing 9.6 gram of acid. The alcohol is a moderate 12.5%. It begins with aromas of peach and lemon, leading to flavours of lemon, lime and stone fruit. The bright acidity does indeed balance the sweetness. The finish is exceptionally long. The wine is delicious now but it will age to even greater complexity and richness. 92.